Chairman Kelvin Thomas says talks are already underway to find a replacement for Dean Austin, who was sacked as Cobblers chairman on Sunday night. 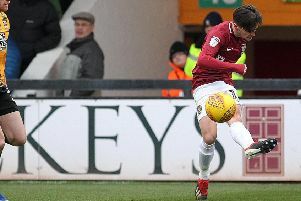 Austin lost his job in the wake of Saturday’s 4-0 hammering at the hands of Mansfield Town, with Thomas insisting that current performances and results left him and the board with little choice to make a change. The Cobblers are 21st in Sky Bet League Two, having won just one of their 10 league games to date. They are only two points above the relegation zone. Town have claimed just one point from their past four matches, and Thomas, who was at Field Mill to see the team’s surrender at the weekend, decided it was time for a change. Austin becomes the fourth Town manager to lose his job in less than two years, and the third in 13 months, and Thomas knows the next appointment has to be right. He says he wants to go for a manager with league two experience, and wants somebody who will come into the club and ‘ruffle a few feathers’ in what is an under-performing squad. “We need to fix the football side, and we need to find someone to come in quickly and fix that,” said Thomas, who praised Austin’s professionalism and work ethic. “We do have some ideas about the type of manager we want, and we are in discussions. “I go back to when I brought Chris Wilder into Oxford, and what were the reasons why we brought Chris in? We looked at experience in the league, and that was an important factor. “The club had gone through a relegation and was struggling a bit, and we looked at somebody who had managed in the league, and that was important. “That is also important for us now, and we want somebody who wants to come in, wants the job, wants to be part of the club, wants to be part of Northampton Town, and can hit the ground running and shake things up. “We also want somebody with a bit of a ruthless side, somebody like Chris, who I have spoken to in the past few days, and we need somebody who can be ruthless and is not afraid to ruffle the feathers or to make big decisions on players. Austin has lost his job just four months into a two-year contract, but Thomas feels the next man to come in will probably be handed the role until the end of the season, and will simply be tasked with keeping the club in the Football League above all else. “I think we are looking someone to come in, similar to what we did with Justin (Edinburgh), who had short-term targets when he came in,” said Thomas, referring to Edinburgh taking over from Rob Page in January, 2017, and helping the team avoid relegation from league one. “There is a reality to all of this, and we are angry and frustrated that we have the budget that we do, which we think is a good budget for this league, and we are talking about staying up. “That is a big frustration for us, because the money is coming out of our pocket, and when you see performances like Saturday it does make you angry, it does frustrate you, but we have to get over that. “So in any agreement would there be some incentives for ensuring we stay in this division? Yes I think so. “Would we possibly be looking at a contract until the end of the season? Yes. Thomas isn’t ruling out an appointment being made before Tuesday night’s PTS Academy Stadium date with Bury (ko 7.45pm), but insists the team is in safe hands even if that is not the case, with Austin’s assistant Andy Todd stepping up. “At the moment, Toddy is taking training with the view that he takes the game on Tuesday night, but we are having discussions and that may change over the next 24 hours,” said the chairman.